My Furniture is Stuffed with WHAT? 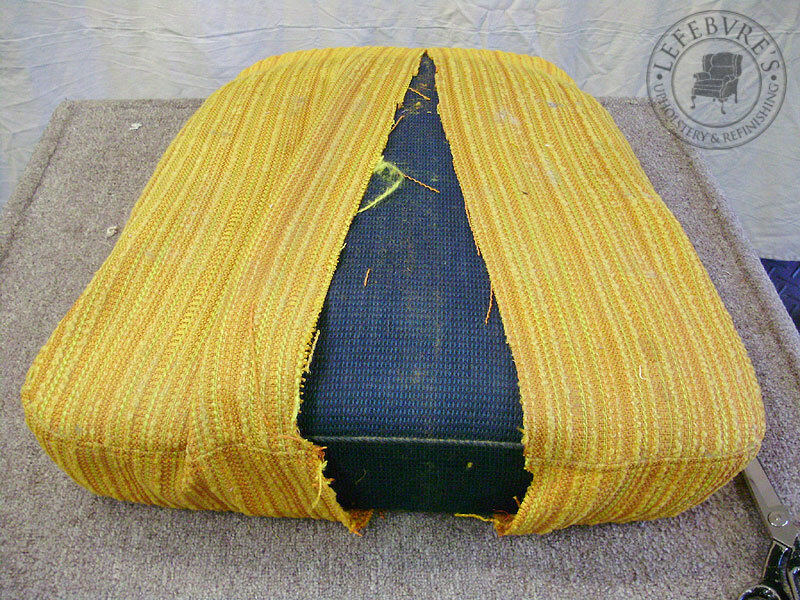 This post will serve as a bit of a quick upholstery lesson for those who may be interested. 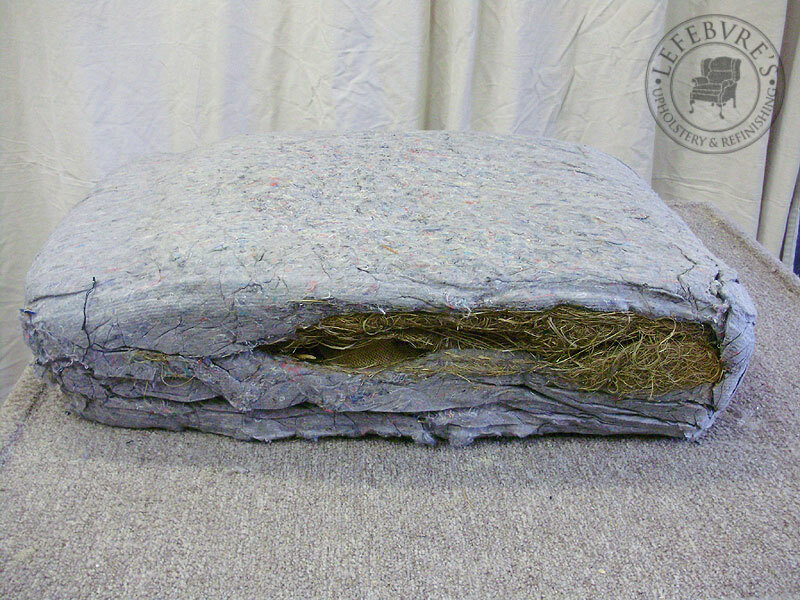 It happens quite often that some of our clients are shocked by the fact that a chair or sofa could be stuffed with straw. 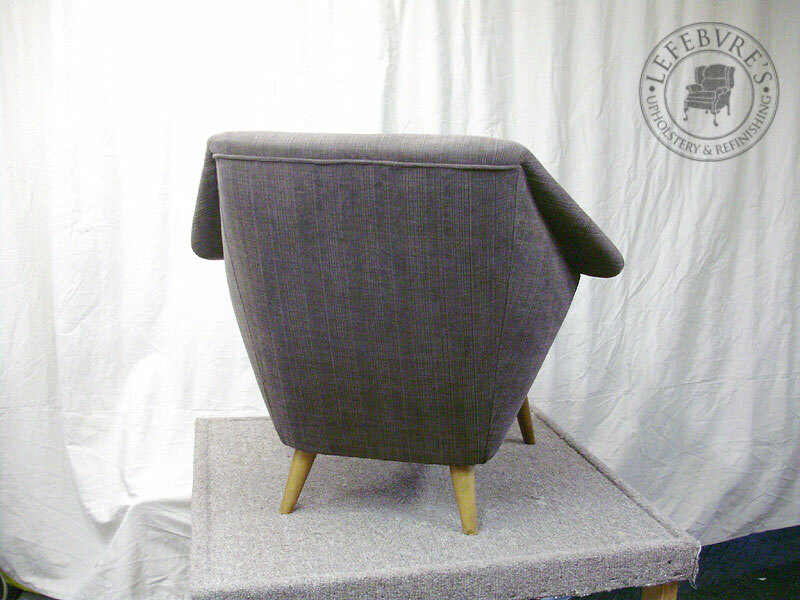 Most people know about horse hair, but there is a wide range of materials used to stuff upholstered pieces, and the point of this post is to just quickly explain a few of the most common ones. 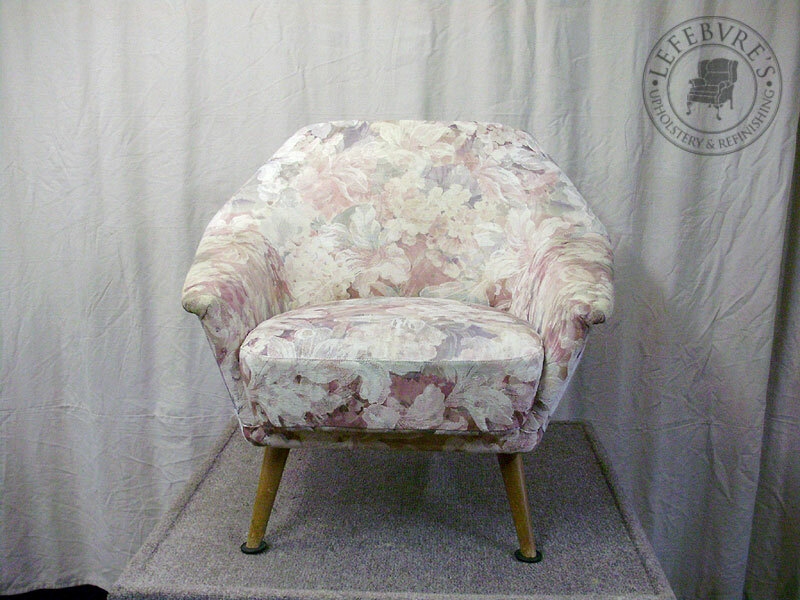 The stuffing materials discussed here mainly pertain to antique pieces older than 1950. By far one of the most popular stuffing materials (which has been used for centuries) is straw. 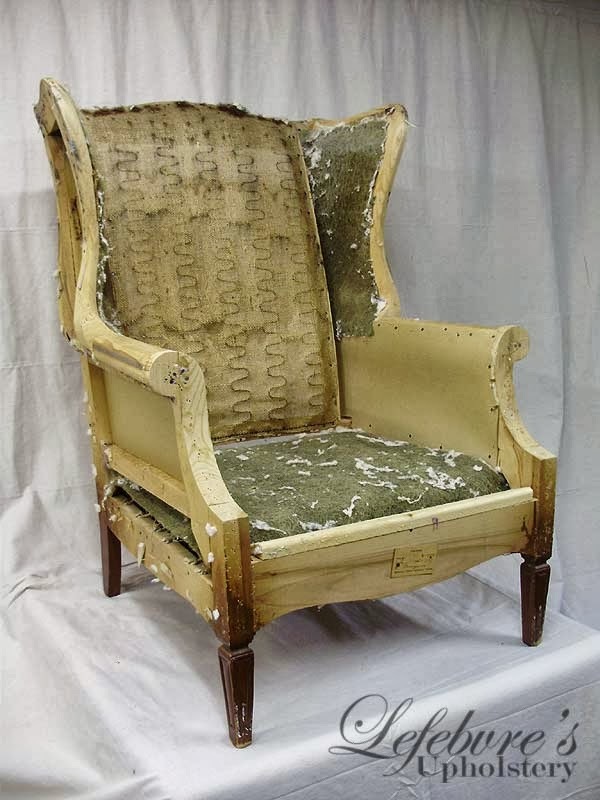 When I first started working for Pierre at Lefebvre's Upholstery, I wasn't really aware of just how common it is to find straw in upholstered furniture. I had assumed that straw was mainly only used in cheaper pieces, but that isn't the case. 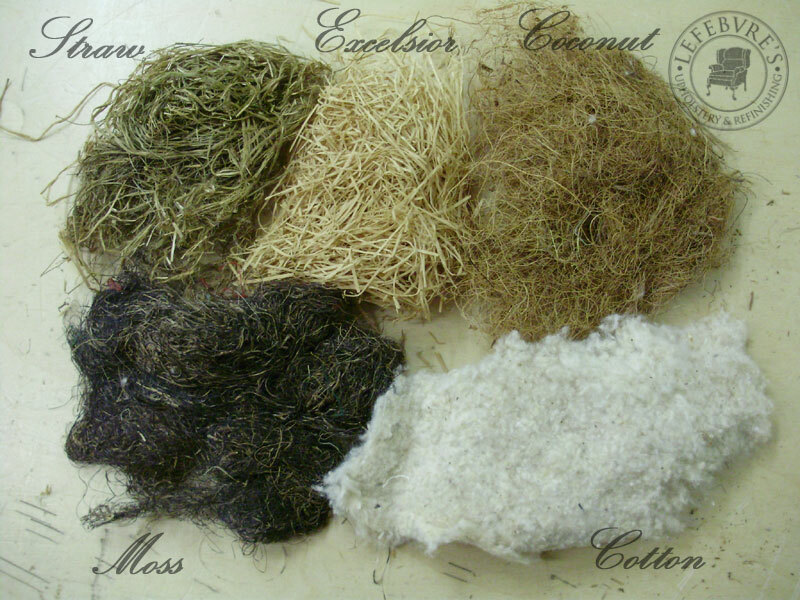 While better pieces will have more hair or moss than straw, straw is still often used as a base layer, and can sometimes be the only stuffing material used along with some cotton. The advantage of straw is that it's very durable, cheap, and it was readily available. 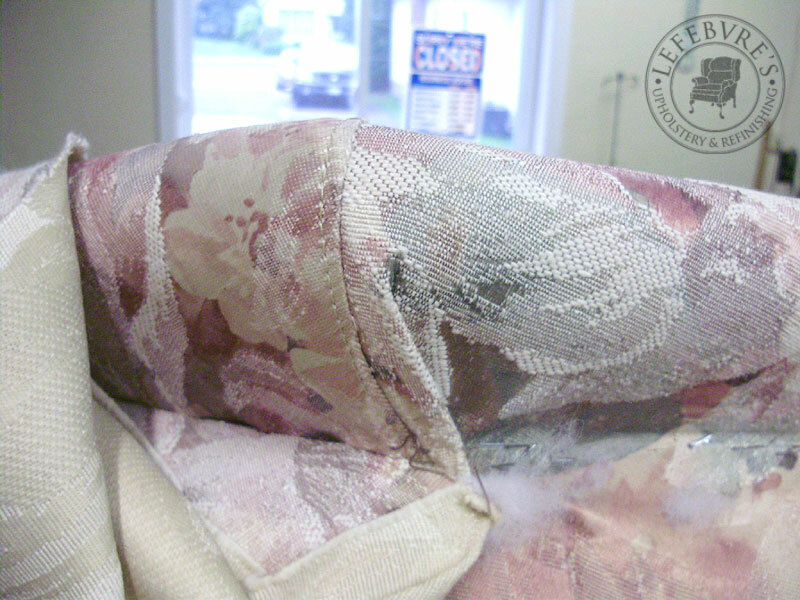 If the chair or sofa is properly maintained, it can last well over 100 years. It doesn't last forever, though, and on heavy wearing pieces, it will eventually wear itself into dust. 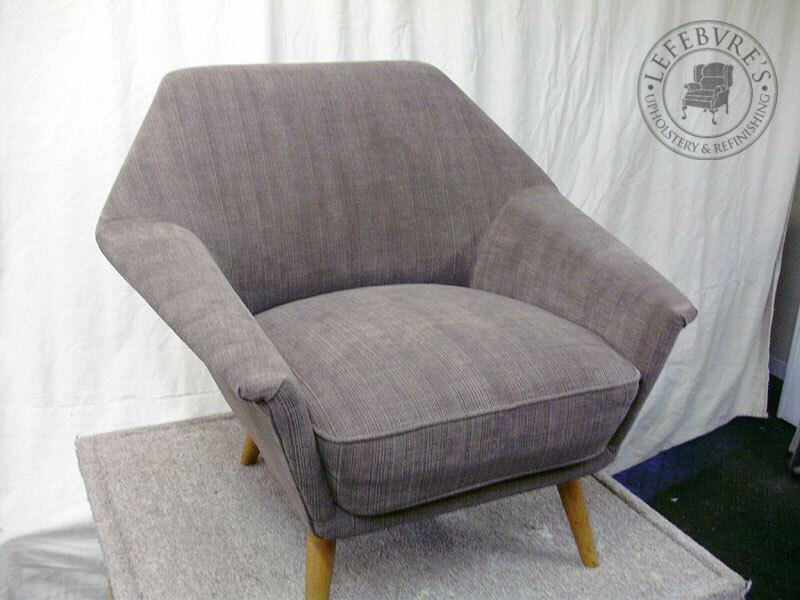 Disadvantages: It's messy, and a good bottom fabric must be used to prevent dust and fibres from billowing out of the chair or sofa bottom. It can also cause allergic reactions to some people from the fine dust. Some clients prefer to have the straw replaced with foam, but in most cases, the straw is reused. The last bit of info I want to pass along is that there IS a difference between straw and hay. They are not the same thing, and you can't use hay in upholstery. Coconut fibre is much less common on antique pieces. 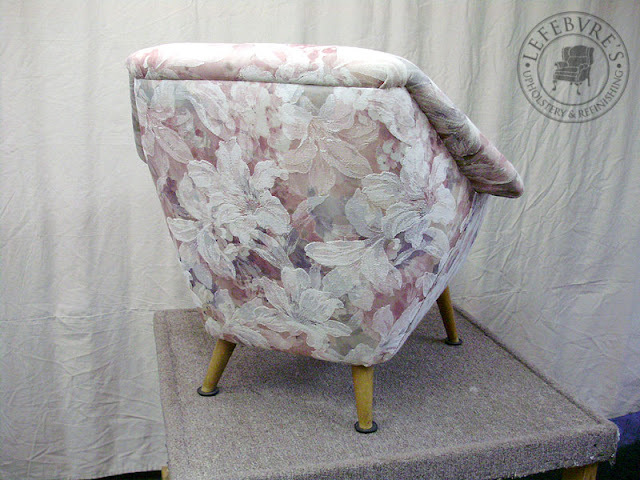 Over the past year, I have seen it only once or twice, and in both cases, it was added by a later upholsterer to "fill-in" bare spots, or to add a bit of additional padding. The fibres are somewhat "crunchy" feeling, and offer a decent amount of resilience. 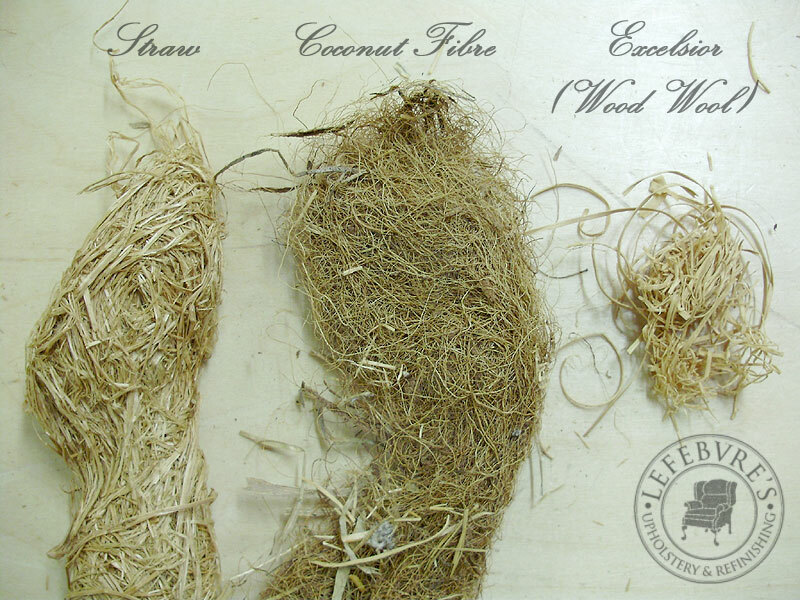 Coconut fibre is often used in place of horsehair. 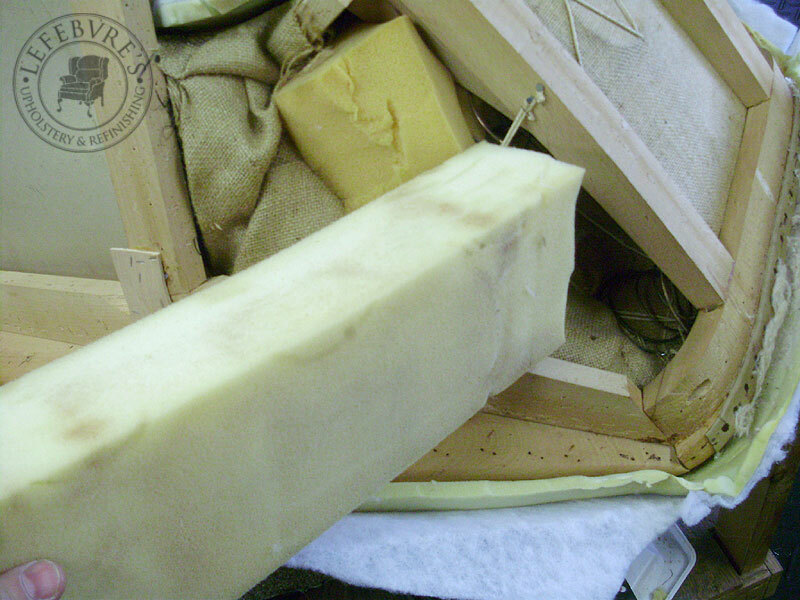 Excelsior is also known as "wood wool" and it was originally invented as an alternative stuffing for mattresses. It dates back to the 1840s, and it's basically thin wood shavings produced by machine. 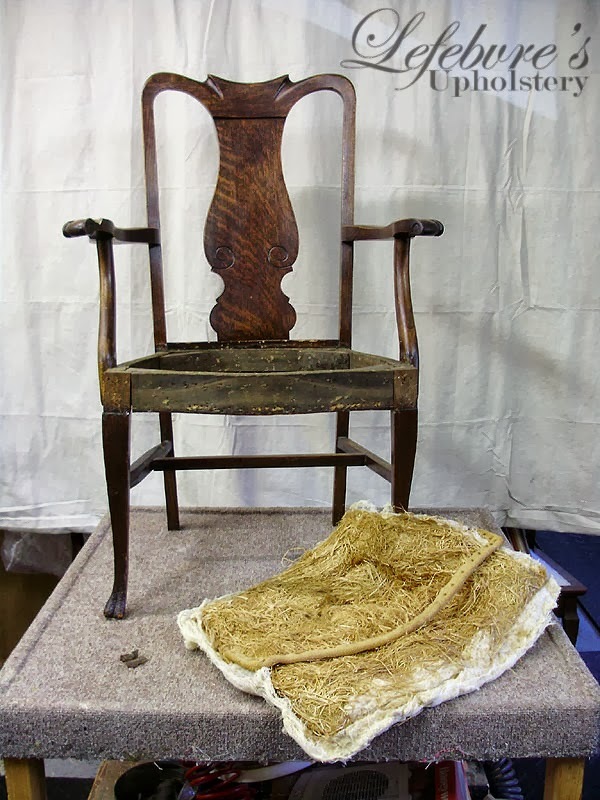 It often resembles straw, and it is found occasionally in chairs (particularly Victorian ones) in place of straw. Second to straw, the second most popular stuffing material found in antique pieces is moss. This is not the kind of moss you would find on the forest floor. 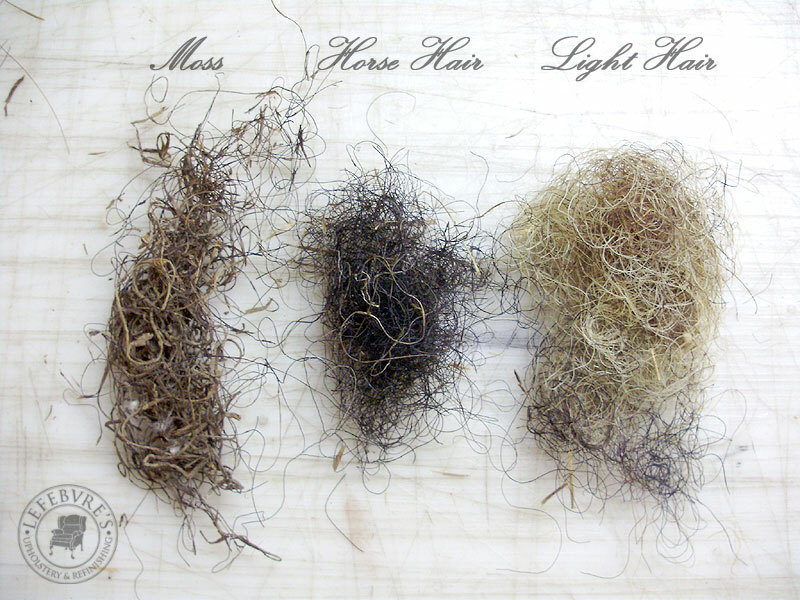 The moss is actually Spanish Moss that has been treated to produce a dark curly stuffing material similar in appearance to horse hair. It is usually called "black fibre". I have seen sofas almost entirely stuffed with this material. From what I've seen, this material is very long lasting, and other than leaving a small bit of black dusty residue, I haven't really noticed any excessive wear to it, even on pieces over 100 years old. 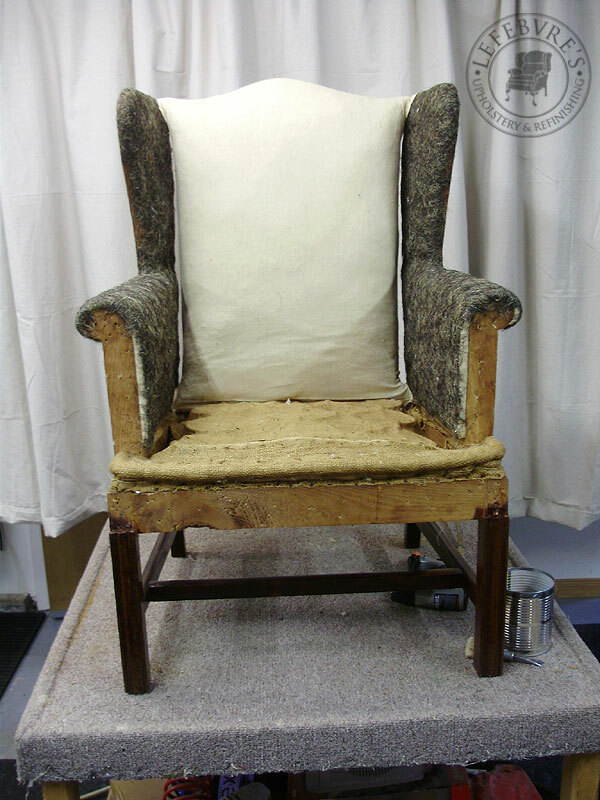 Horse Hair: Horse hair is by far the best material to be found in antique upholstery, and it is usually a sign of a quality piece. The hair is a rich black, and has a very springy "plastic-y" feel. Because it was expensive, it will often be found only as a thin top layer over a cheaper stuffing (such as straw and moss), or mixed together with cheaper curled hair. Light Curled Hair (usually hog hair): Several other types of curled hair are also used in upholstery, and are nearly as good as horse hair. They range from nearly white, to light yellow, or brown, and are always worth reusing. 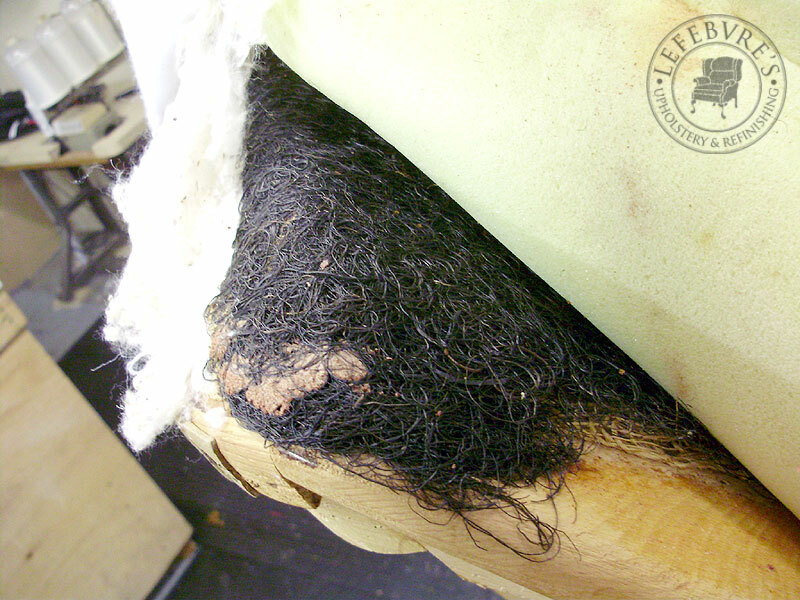 Rubberized Horse Hair: Rubberized horse hair is usually found in the form of a mat of hair cut to suitable shapes. It is simply curled hair that has been coated with a rubber material (as the name suggests). 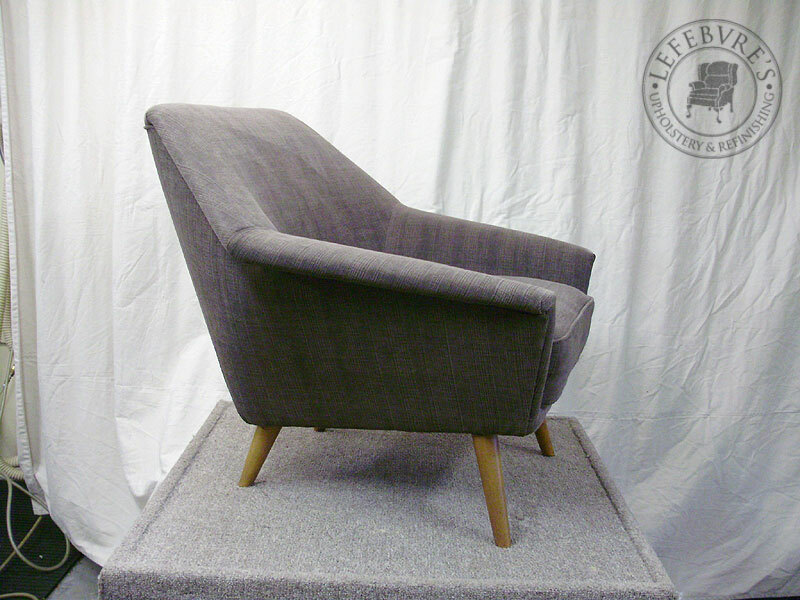 You can see an example of this hair in the 1962 Wing Chair that we worked on last year. In the photo you can see rubberized horse hair on the wings and deck. 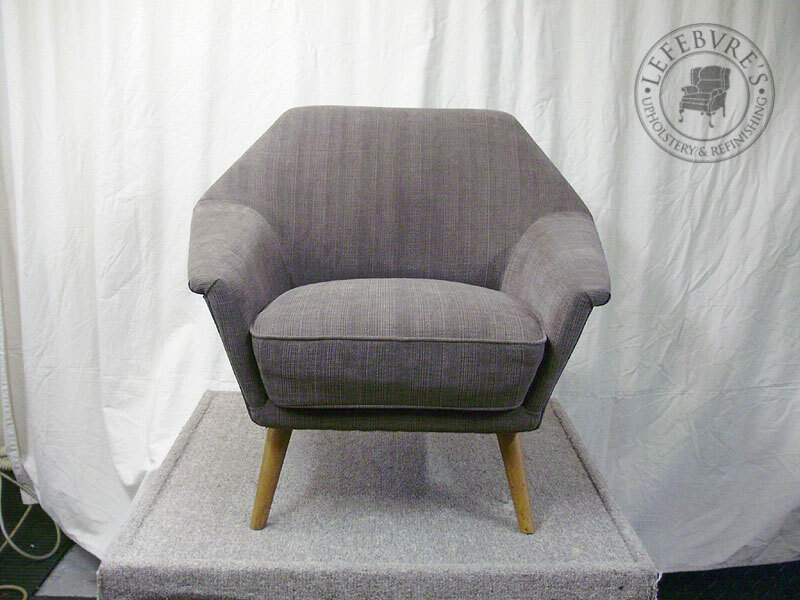 Lastly, we have the outer-most stuffing materials, which usually consist of a layer or two of cotton or felt, or sometimes Kapok on smaller chairs. The outer layer of cotton is often covered with a thin cotton fabric (a rough cover). 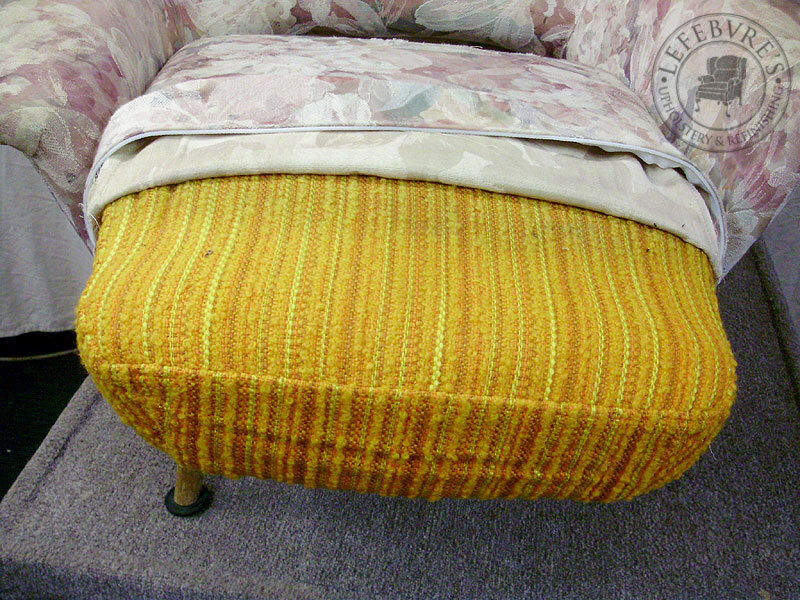 Cotton used in upholstery is supplied in large rolls, and it is about 1" thick when not compressed. 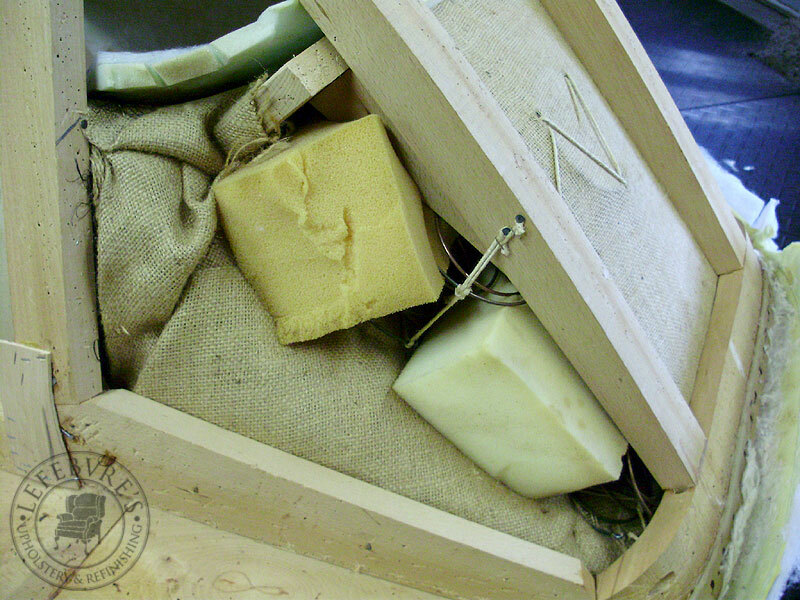 The cotton is soft and fluffy, but it contains lots of little flakes and imperfections. Older cotton tends to be more dense (from compression), and with fewer imperfections. The cotton is used over top of all previously discussed stuffing materials, and it helps to even-out any small bumps and imperfections from the layers beneath it. It is absolutely essential over curled hair, since it will prevent the hair from poking through the finish fabric. Cotton that is still in good shape is reused, but if it has become too lumpy, torn, or soiled, it is replaced. KAPOK: Kapok is rarely seen, but makes an appearance here and there. It is a silk-like fibre obtained from the large seed pods of the Kapok tree native to Mexico, and areas near South America. The fibers are similar to those that you would find in milkweed pods. 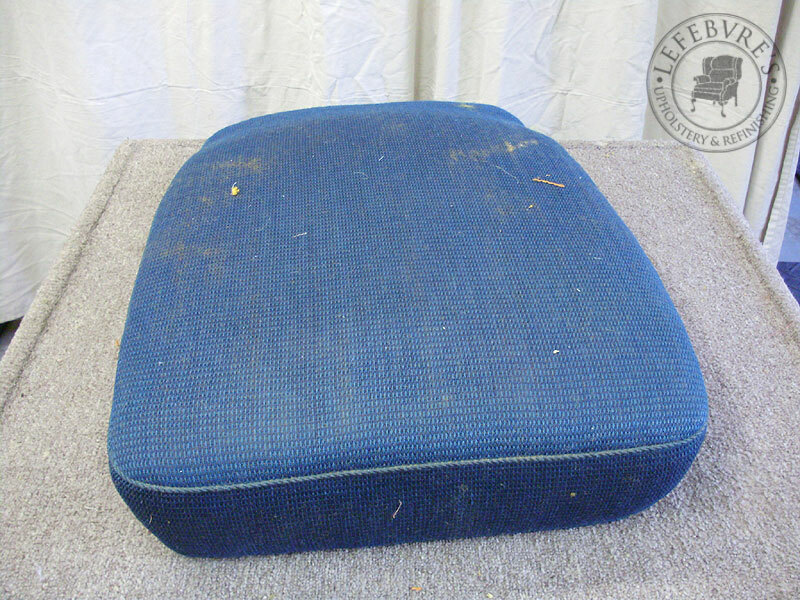 They are used in pillows as an alternative to down, or they are compressed into a felt-like padding used on chair seats, usually Victorian occasional chairs, or dining room chairs. This was an interesting pair of chairs to work on. At first glance they didn't appear to be very old, but once we opened them up, we found that they were probably from the 1930s or 40s, perhaps early 50s. They have coiled backs, with straw and curled hair or moss stuffing, and the cushions are also sprung, and were stuffed with straw and felt/cotton. 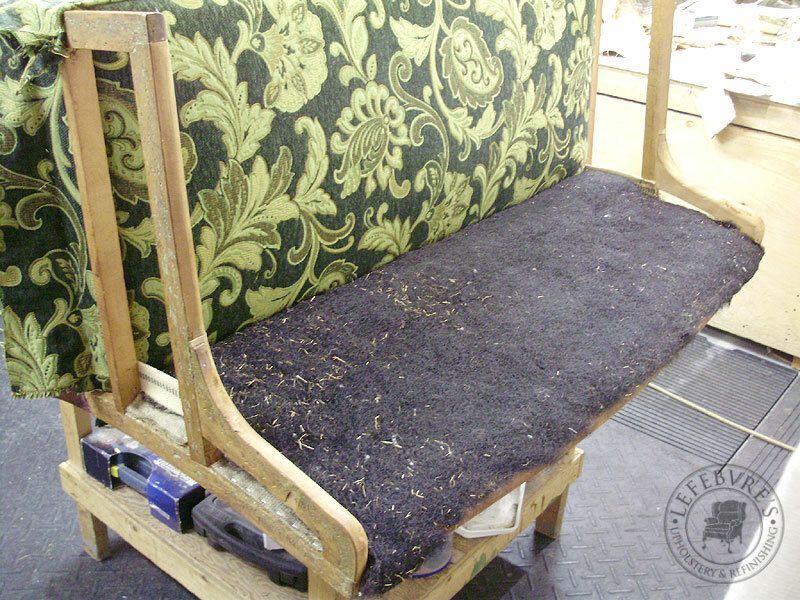 Some of the corners/joints under the current upholstery were sloppy, so we made corrections on the new upholstery. Sadly I forgot to photograph these, but basically we tightened up the corners and had a sewn seam here. 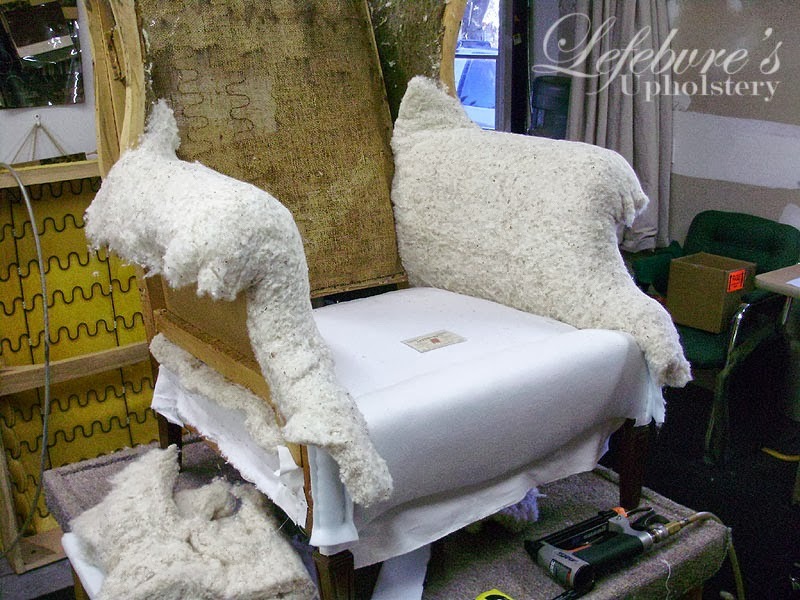 A previous upholsterer had stuffed foam in between the springs. We don't know why. These blocks were removed. Here is some of the old original stuffing. The seat cushions turned out to have 3 layers on them. The floral, the orange, and then a deep blue. 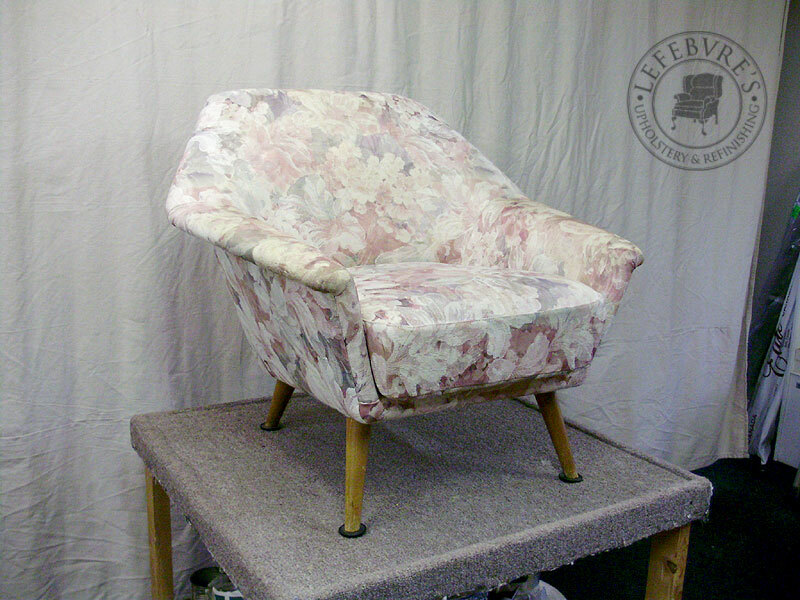 Bare cushion (viewed from the side). You can sort of see the springs, which are sandwiched in layers of straw and felt/cotton. 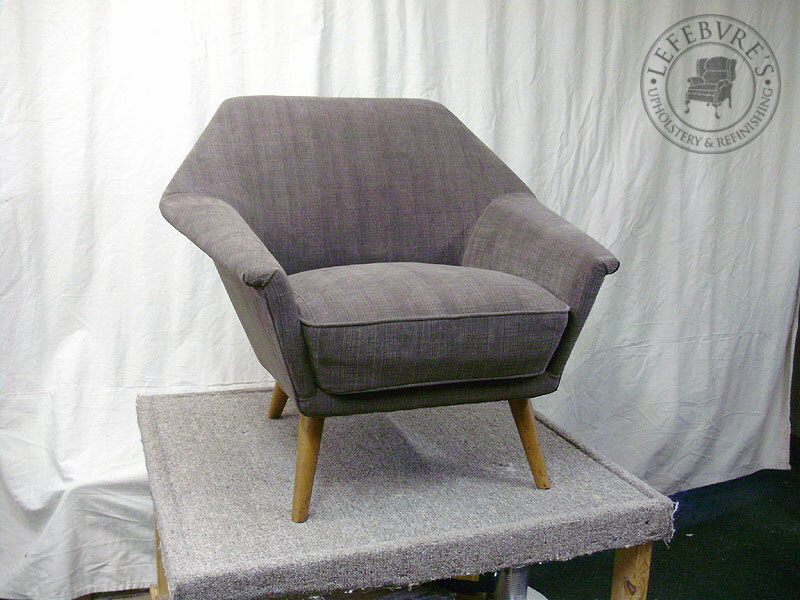 Here are the finished chairs (only one shown). The wooden legs were also touched up.